We hope you find these free jewelry making videos both informative and entertaining. 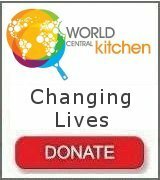 These videos are just the beginning and we plan to be adding videos on a regular basis. These videos include a wide range of jewelry making techniques and will also introduce you to some of our unique products. You will see in real time the steps to complete a project. The technique is what is important. Please feel free to add your own touch of creativity to each project. How to etch brass with Hydrogen Peroxide and Muriatic Acid. This video shows the detailed steps to designing, etching, shaping and applying patina to a brass cuff bracelet blank to make a truly unique antiqued brass cuff bracelet. This video shows an easier and faster way to make a beautiful captured bead necklace and earring set using semiprecious no hole beads and jump rings. Only half the jump rings are open and closed saving time. 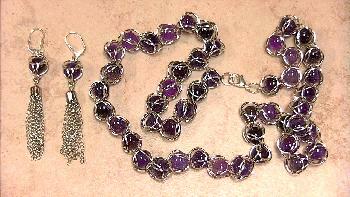 The no hole beads are captured using jump rings to form a chainmaille weave chain. 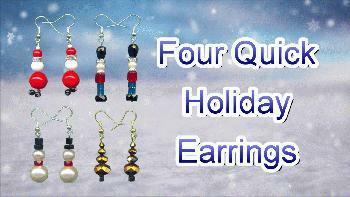 This video shows how to make four very simple and quick holiday earrings including Christmas Tree Earrings, Santa Claus Earrings, Nutcracker Earrings, and Snowman Earrings. This is great for beginners and for making holiday gifts. 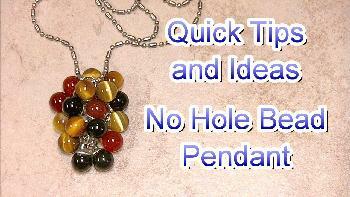 This is a very easy project to make a no hole bead tassel pendant. Bead caps are glued to 10 mm semiprecious beads and attached to a short chain with 6 mm jump rings. 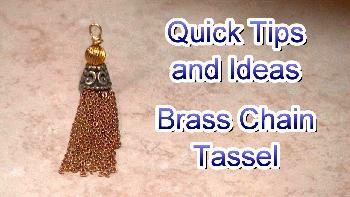 This video shows how to easily make a brass chain tassel from tangled and scrap brass chain for your jewelry making projects. 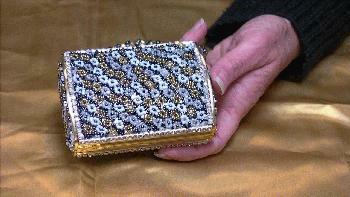 No soldering is used to make this tassel. 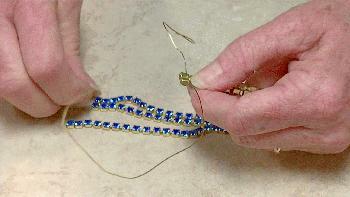 This video provides detailed instructions to quickly and easily make a rhinestone chain tassel for jewelry making and jewelry designs. 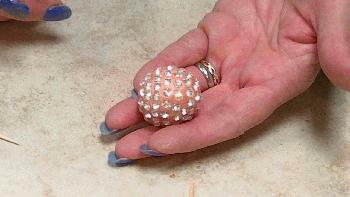 This video shows how to mix and color two part epoxy clay to make a rhinestone epoxy clay bead. This is a simple bracelet project using vintage three hole plastic beads and scraps of rhinestone chain to create a unique bracelet design. 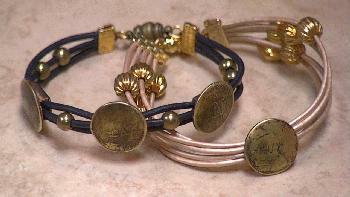 Brass slider findings provide a quick and easy way to make a unique bracelet. 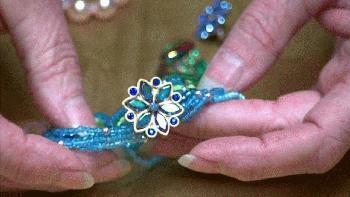 Just slide them onto some cords, add some beads, crimp ends and a clasp and you have a finished bracelet. Here are some embellishment ideas you can try with these vintage Japanese stones. 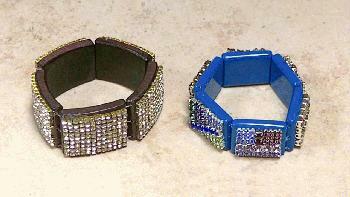 They may be used to create truly unique cuff bracelets as well as enhance other jewelry making projects. We have a large assortment of vintage seed bead necklaces and bracelets. 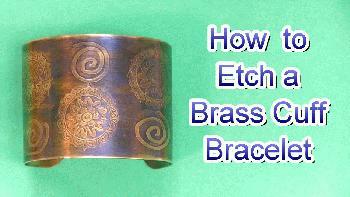 This video shows how to use these to embellish brass cuff bracelets and metal purse shells. Bead enhancers are an easy way to embellish your necklace and bracelet designs. 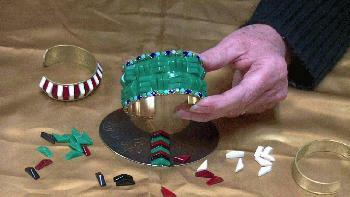 The enhancer simply clamps on to your beads to change the appearance of your design.